Big Papa headed off to work with his turkey sandwich today, just like he’s done every day since we grilled our post-Thanksgiving turkey this past Saturday. I’m sure some of you, or at least those who eat turkey, have been scouring the internet looking for turkey leftover recipes. But, have you considered what to do with your turkey carcass, other than toss it in the garbage? I say, make turkey stock! If you don’t, you are missing out. Making stock is one of the best ways to use what’s left from your turkey. Plus, you’ll collect bonus points for stretching your precious food dollars even farther. At this very moment I’ve got turkey vegetable soup, made with homemade stock, simmering on our stove. The kitchen smells amazing and I can’t wait to serve up our soup. I also plan to try a recipe I found for turkey-leek risotto. How about you? What would you do with turkey stock? Note: You can use this recipe with a chicken carcass too. TIP! Use 2 cups dry white wine for a nice rich flavor. It’s optional–if you don’t use white wine, add more water. TRICK! (Thank you Auntie Kate) Save cooking scraps in Ziploc freezer bags. Onion skins, raw potato skins, raw or roasted sweet potato or yam skins, apple cores, bell pepper seeds and stems, leek ends, spinach or collard stems, wilted but not rotten veggies from the fridge are all candidates for stock. Note: Do not ever use table scraps in stock. Ever. Use only cooking scraps. Note: Citrus, melon and squash rinds don’t work well in stock because they are too bitter when cooked. TIP! Chopped fennel bulb can be used in place of the oft recommended 2 stalks of chopped celery. I personally love the slight anise flavor. Again, large chunks. Place your turkey carcass in a very large pot, breaking the bones into smaller pieces if necessary so that it will fit. Cover with white wine and water. Turn the burner on to medium heat. Add veggie scraps, carrots, onion, fennel or celery and garlic. Just before water starts to boil turn the heat down to low. Use a spoon to scrape off any scum that rises to the surface (also little bubbles). These are all fat and other impurities and if you skim them off then your stock will be clear and even more divine. Let the stock simmer for 1 to 1-1/2 hours, checking periodically to skim off any scum. Add parsley and bay leaves and simmer for another 1 to 1-1/2 hours. Use tongs to remove and discard the carcass. Pour stock through a fine mesh strainer into a large bowl or Tupperware (TRICK! Do this in the sink in case there is spillage), and season with salt and pepper, to taste. 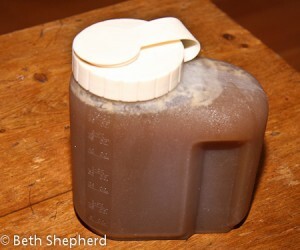 Stock keeps two weeks in the refrigerator and several months (up to six) in the freezer. TIP! Freeze stock in 2-4 cup portions so you only have to thaw out small amounts to use for your recipes…much easier than trying to chop off a chunk of frozen stock (not that I have done this, mind you). TRICK! When reusing stock reserved in the refrigerator or thawed stock, pour through fine mesh strainer again to remove any fat that congeals at the surface. Bonus TIP! 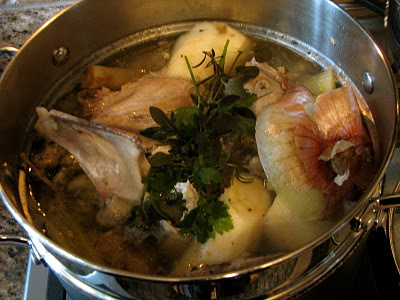 (Thanks again, Auntie Kate) For even more flavorful stock, before you do anything else, heat ½ cup of water in a large, heavy stock pot, on high or med-high. Chop the onion into dime-sized pieces. Put the onions into the hot water and spread them out across the pot with a wooden spoon. Allow the liquid to cook away, and watch closely to avoid burning. When the bottom of the pot is turning brown and the onions are sticking, pour in the rest of the water (and wine if using wine) and scrape the brown from the bottom of the pan. This gives the stock a depth and savory-sweetness you won’t get if you skip this step. Hope everyone had a delicious Thanksgiving. Happy stock-making! For more yummy tips and tricks, check out Wanderfood Wednesday!